Percy is an award-winning film-maker, and so the production quality of the film is quite high. The film is 30 minutes long, with three 10 minute interviews (to fit into Youtube's ten minute max). 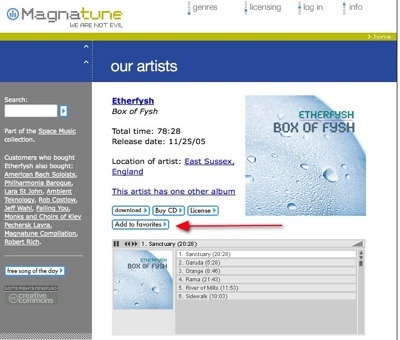 Members can now instantly import their favorite Magnatune albums into iTunes. It's instant, because what gets imported into your iTunes library is a link to the streaming version of the entire album. That way, you don't have to download and store gigs of music onto each computer you want to listen from. And, if you use multiple computers to listen to Magnatune, you'll have your favorite music available from either the web site, or iTunes, and always up to date. Here's how it works. The "m3u" playlist format has always been oddly handled by iTunes. Unlike most programs, that play and then discard the mp3s pointed to by m3u playlists, iTunes always imported the streaming mp3s right into your library, and mixed the streaming (remote) mp3s with your on-disk (local) mp3s. That's a neat feature, if you could make it work right. 1) instead of downloading the music to iTunes, we're giving you streams. This is so that the export is instantaneous, there is no downloading step. If you're connected to the Internet, you'll be able to listen to the albums as you normally would, it just happens that iTunes will get them off the 'net as you play them. 2) the entire album is imported as one mp3. We did this, so that you could import dozens of favorite albums, and not clog up your library with tons of songs. My favorites list is 189 albums long, and I don't really want over 2000 songs added to my system. If there is an album I want as separate songs, I can still download the album. 3) if you want local files, and to download the music, you can still do so, with the "personal podcast" feature. That will put the music on your hard disk, and your ipod. This new instant-iTunes-import is in addition to that. 4) if you add albums to your favorites, you can re-import the entire favorites from Magnatune. iTunes is smart enough (with streams) to determine the duplicates and only add the newly-marked-as-favorite albums. When you go to play your favorite albums on Magnatune, there now an "iTunes import" link. I put red arrows on the graphic above, to point out an interesting aspect of how iTunes works. iTunes doesn't have any way for us to specify artist name, album name, or duration, in the m3u file. However, after you have played the mp3 for at least one second, iTunes reads that info in, and incorporates it into the library. The first red arrow on the graphic above shows the album length of an album I've previously played. Until you play the album, iTunes simply display "continuous" where the album duration should be, and leaves artist name/album name blank. Once you've played an album, everything looks right. We *could* have worked around this odd way that iTunes worked, by writing directly to the iTunes library. However, there are different ways to do this on Windows and Mac, this would have entailed your downloading and installing software from me, and there would be the risk that we had a bug in our software and screwed up your iTunes library. Instead, I preferred to stay simple and safe, and use a standard m3u file format. One other side-effect of using the m3u file format, is that the "iTunes import" link will play your favorite albums in both WinAmp and Windows Media Player. However, neither of those programs makes it easy to save the playlists in your permanent library (please post a comment to this blog entry if you believe otherwise). This feature is available for both streaming and download memberships. Magnatune Members now have a bunch of features wrapped around the concept of "favorites". 1) one-click add albums to your favorites as you listen to them. Download them later, when it's convenient. 2) listen to all your favorite albums (sequentially or as a shuffle mix) on the web with our flash player, or inside your own media player via the m3u/ogg/xspf links. 3) personal podcast: if you subscribe to your favorites using podcast-download software (such as iTunes), then the albums you mark as favorites are automatically downloaded in the background, and added to your iPod. Favorites are automatically downloaded and added to your Windows Media Player Library, when you use the free "Juice" podcast download program. Both the stream and download memberships have access to these features (though the stream members can't download the albums, they can do everything else). Here is a detailed breakdown of how these features work. And finally, here is the feature I like best. Magnatune will make a personal podcast feed for you, of your favorite albums. If you subscribe to it in iTunes, then your favorite albums are downloaded in the background. If you have set your iPod up to sync podcasts, then your favorite Magnatune albums are automatically added to your iPod. I like this feature because I have lots of computers and iPods, and now I can mark my favorite albums at Magnatune, and have them automatically downloaded to all my computers and devices. I add a new album to my favorites, and every device & computer gets it automatically. By the way, instead of using this "personal podcast" feature to download your favorite albums, we also have an "instant iTunes import" feature, which you can find on the bottom of the "play" page. That feature lets you listen to the albums as streams from within iTunes, without having to download the albums. Juice (which is is free, by the way) automatically adds your favorite albums to Windows Media Player. 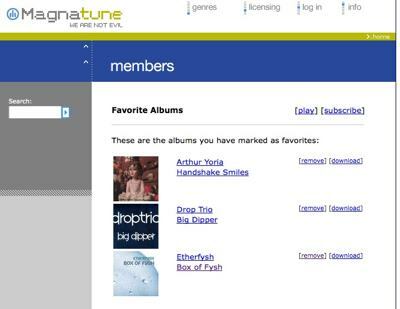 You'll find your favorite magnatune albums in the "Library" tab of Windows Media Player, under the "My Playlists" section, under "Magnatune favorite albums". Because Windows Media Player loves to try to sell you stuff, in the graphic above you can see that they are showing your favorite Magnatune album for sale at Napster. This is actually fairly useful, because it causes Windows Media Player to show you a) album art b) release date c) number of songs and d) song names. Just ignore the "buy" buttons. As I add albums to my Magnatune favorites, Juice (or iTunes, or whatever you're using) automatically downloads them in the background. Cool! And I personally really like having the newly added albums added to my iPod automatically. You can now "embed" any of our albums on your blog or web site. This means that visitors to your web site can listen to the music you have chosen (as I have, above). Try pressing the triangular > play button to see how it works. This is especially useful if you are blogging about a Magnatune album, and would like people to listen to the music while they read your review. Or, if you're a Magnatune musician and want people to listen to your music on your web site. and is especially suited for putting in the margin of your blog. b) you can change whether the music starts automatically when the page loads, or whether visitors need to click the play button. c) You can change the height and width. On a wider player, the song titles don't have to scroll by, since there is enough place for them on the player. You then copy the code in the text box, and paste it into the appropriate place on your blog or web site. Just as on the Magnatune web site, at the end of each song you will hear a woman telling you what you just heard. If you click on the album art, or the "click here for artist info" link, you will be taken to the Magnatune web page for that artist. I preferred to not have a "buy it now" button (though lots of people suggested it), as I felt that was heavy-handed, and anyone who was interested in buying it, would first click "artist info" anyway. My friends at Jamendo have a feature like this, and they tell me that they have more people listening to their music from other sites than on their Jamendo web site.